#Office365Challenge – Ever need to change data in Excel displayed as columns to rows? No retyping necessary. 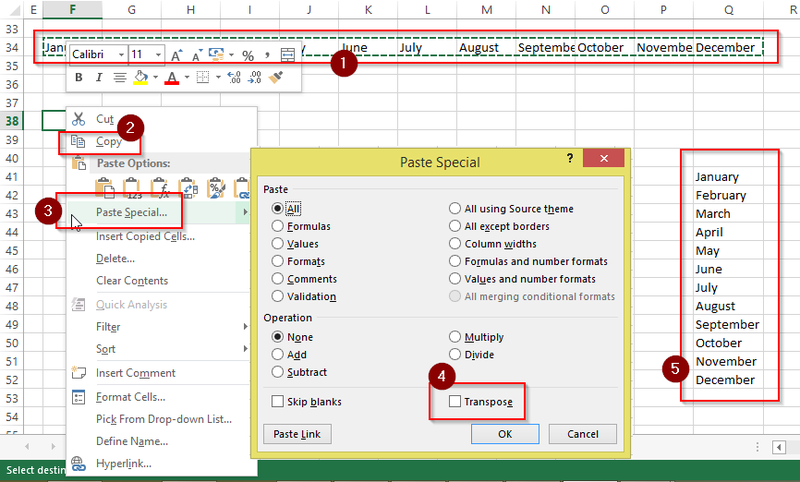 This is very easy to accomplish with Paste Special – Transpose. All you have to do is select the data (1), Copy (2), Right-click > Paste Special (3), Transpose (4). And voila!! (5). Keep in mind that these tips and tricks do not only apply to Office 365 – but to the overall Microsoft Office Suite as well as where applicable, SharePoint.